Wales' World Cup dream ended in the most heart-breaking fashion as they fell one point short after an epic effort in Auckland. A controversial red card for skipper and key man Sam Warburton reduced Wales to 14 men for 61 minutes and seemed to have cost them the semi-final as Morgan Parra kicked three penalties for France. A stirring, tireless second-half display somehow kept them in the game, Mike Phillips darting over for the game's only try with 23 minutes left to set up a desperate finale. But Stephen Jones hit the post with the conversion which would have snatched the lead, and Leigh Halfpenny then came up just short with a long-range penalty at the death. For France, beaten twice in the pool stages and seemingly on the ropes, now comes their third World Cup final in the most unlikely of circumstances. It was an evening to haunt Welshmen for years. France offered almost nothing despite their numerical advantage, while two first-half missed penalties from James Hook were also critical in the final analysis. With a heavy rainstorm hitting Eden Park just before kick-off both sides struggled to control the ball in the early stages, spilling possession deep in each other's 22m. But it was Wales who got on the board first when Hook landed a beautifully-judged penalty from the right touchline after France captain Thierry Dusautoir had gone offside at a ruck, although the departure through injury of tight-head Adam Jones - replaced by Paul James - quietened the noisy Celts in the crowd. Hook then missed a far straighter penalty from 40m after his standing foot slipped, but Wales then set up camp deep in the French half, Roberts smashing through the defensive line only to hit Jonathan Davies in the face with a pass that could have put his fellow centre in. The game then turned on a hugely controversial call from referee Alain Rolland. Warburton, so impressive throughout the tournament, lifted Vincent Clerc off his feet with a big hit and then turned him in the air, leaving the Frenchman crashing onto his back. Rolland had no hesitation in pulling out his red card, stunning both Warburton and the crowd, but from the stands the tackle looked more misjudgement than malicious - a yellow card and no more at such an early stage of such a big contest. Parra's subsequent penalty levelled the scores, and it then took desperate Welsh defence to keep out first Jean-Baptiste Poux and then Maxime Mermoz. Hook had another chance from distance but again missed to the right, Parra nailing a simpler penalty from 35m to put Les Bleus 6-3 up with the interval approaching. Somehow Wales were still pressing, the outstanding Toby Faletau battering off a scrum to set up good field position only for Hook to mis-hit his attempted drop-goal under pressure. The red card had sucked all the life and passion from the capacity ground, and as both sides restricted themselves to kicking for territory after the break the atmosphere remained curiously flat. Wales coach Warren Gatland opted to replace the disappointing Hook with the 102-cap experience of Stephen Jones after 45 minutes as his side sought to get some sort of grip on the game. France, their forwards keeping it tight, began to put the denuded Welsh defence under increasing pressure. Relentless tackling protected the try-line but when a rolling maul from a line-out was taken down, Parra popped over a simple penalty for 9-3. Wales were pinned deep in their own half, forced to kick away any possession, and with 25 minutes left it was hard to see any way back for them. Then Phillips, just as he had against Ireland in the quarter-final, took the match by the scruff of the neck. After powerful rumbles from his forwards, the scrum-half spotted a gap between the two French locks and accelerated through and away for the first try of the match. Jones had the chance to put Wales in an unlikely lead but missed the straightforward conversion to leave it 8-9 going into a tumultuous final quarter. 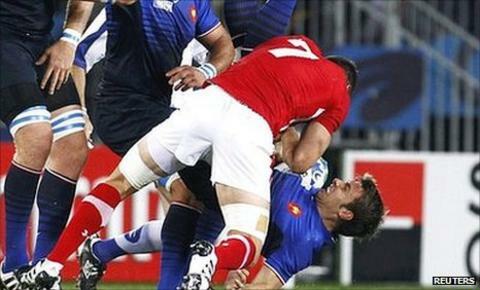 France were stunned, 14-man Wales in the ascendancy despite another missed drop-goal attempt. As the minutes ticked down the atmosphere became increasingly fraught, the tireless Welsh forwards somehow stealing away French ball and a grubber kick from Jones setting up promising possession in the French 22, only for another turnover to cost the fly-half the chance of a drop-goal. It was all Wales, even if their possession was taking them sideways rather than forwards. Then, with six minutes left on the clock, prop Nicolas Mas went offside at a ruck to give Halfpenny a shot at glory from the halfway line. The kick had the direction but fell tantalisingly short, and despite a desperate last assault that went through 26 phases, Wales could not work another opportunity, and their exhausted players sank to their knees as Rolland sounded the final whistle. Wales: Leigh Halfpenny; George North, Jonathan Davies, Jamie Roberts, Shane Williams; James Hook, Mike Phillips; Gethin Jenkins, Huw Bennett, Adam Jones, Luke Charteris, Alun Wyn Jones, Dan Lydiate, Sam Warburton (capt), Toby Faletau. Replacements: Paul James (for A Jones, 10), Stephen Jones (for Hook, 46), Ryan Jones (for Lydiate, 55), Bradley Davies (for AW Jones, 61), Lloyd Burns, Lloyd Williams, Scott Williams. France: Maxime Medard; Vincent Clerc, Aurelien Rougerie, Maxime Mermoz, Alexis Palisson; Morgan Parra, Dimitri Yachvili; Jean-Baptiste Poux, William Servat, Nicolas Mas, Pascal Pape, Lionel Nallet, Thierry Dusautoir (capt), Julien Bonnaire, Imanol Harinordoquy. Replacements: Dimitri Szarzewski (for Servat, 44), Fabien Barcella (for Poux, 44), Julien Pierre (for Pape, 61), Fulgence Ouedraogo (for Bonnaire, 75), Francois Trinh-Duc, Jean-Marc Doussain, Cedric Heymans.